Yokai Moon is a turn-based survival management game inspired by the folklore, literature and famous figures of Edo Japan. As the guardian of an enchanted fortress, your quest is to vanquish the maleficent yokai that strike at night by recruiting a team from a diverse cast of villagers, each with their own skills and special abilities, and break the curse of the Yokai Moon. After the incredible response I received after posting Moonlight Fortress, a prototype I created as part of my degree, to Itch last year, I'm excited to announce that I have been working on a full version of the game! Huge thank you to those who played Moonlight Fortress and provided feedback! What can you expect from Yokai Moon? I am fascinated by fairytales all around the world, so have taken this as an opportunity to research a different mythology and share it with you all. Having studied the Japanese language for over two years now, it made sense that Japanese folklore would be my source of inspiration for this project, especially as it's a mythology I know will appeal to many of those in the gaming community! I was delighted when players expressed how much they liked the pixel art in Moonlight Fortress! Since then, I have focused on leveling up my pixel art and animation skills in order to create a game world you will enjoy looking at, as well as interacting with. For a closer look at the art in Yokai Moon, please visit my page on ArtStation. 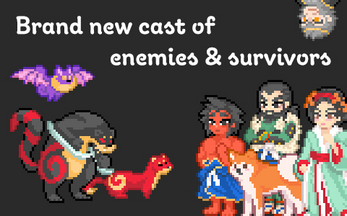 Yokai Moon will have 20 different characters to unlock and eight enemy types to battle! What's more, every character and enemy has a different special ability and combination of stats, making preparing for the night all the more challenging! Villagers can fight with swords or spells! More attractive and intuitive user interface. Music composed exclusively for Yokai Moon. Like Moonlight Fortress, strange things happen under the full moon. Whilst there's nothing available to download just yet, you can keep up to date with the development of Yokai Moon by following me here on Itch or on Twitter.